How is writing a yoga? One is about emptying yourself out; stilling the mind. The other is about filling your head up with story and putting it on the page. The above quote is from the late Indian writer R.K. Narayan. I think he was on to something. My yoga teacher Liz brought an article by Iyengar yoga teacher John Schumacher to class on Saturday. He speaks effortless effort, the point reached when the practitioner has progressed through the various levels of learning, from the very effortful (and sometimes embarrassing) struggle with the basics of a posture through the stage where you have enough knowledge to correct your own alignment to a point you can almost wholly integrate your intelligence into your body. You are skilled enough to achieve a pose without straining or becoming exhausted, and the stillness that comes with union of mind, body, and soul becomes accessible. Not that I’ve achieved stillness like that, you understand. Writing fiction has a similar trajectory. You start out with no clue as to what the difference is between “showing” and “telling,” or why the hell it matters. Your work is filled with “info dumps” and long digressions into backstory that put the members of your critique group to sleep. And whatever knowledge of grammar remains from high school English flies out the window. 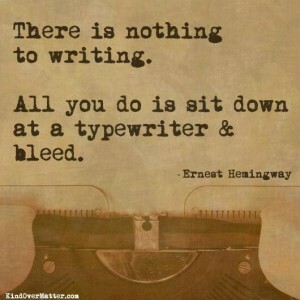 But as you keep practicing writing, it becomes easier to let the words flow. Oh, of course you have to go back because you forgot your heroine has brown eyes and not golden ones, and sometimes you’re stuck on a plot point. Slowly, though, your fictional world becomes so vivid in your mind it seems real. Your characters live and breathe in your heart and mind. The plot unfolds almost without conscious effort on your part. Something mysterious and ineffable happens; the writing becomes effortless; the writer loses herself in it.